One of the most interesting sessions at this upcoming Search Engine Strategies in Chicago is going to be Universal & Blended Search. Dr. Larry Cornett, VP, Consumer Products, Yahoo! Search is one of the top experts in the world on this subject and is also a panelist at this session in SES Chicago. Last week I had the opportunity to chat with Dr. Cornett to get his insight on blended search and to get a better understanding of Yahoo's future in this area. [Manoj]: As with textual search, Universal search will continue to improve amongst the search engines. Are there specific things Yahoo wants to address in regards to the user experience with its search offering? [Larry Cornett]: Yahoo! is committed to providing the best search experience to our users. We are constantly looking at new ways of incorporating different types of content into our search results. A great example is Yahoo! SearchMonkey, which lets any publisher enhance their search results. This technology can be implemented by multimedia publishers who wish to have specifically stylized search results, which showcase the Yahoo! Search engine results page. In addition to SearchMonkey, Yahoo! 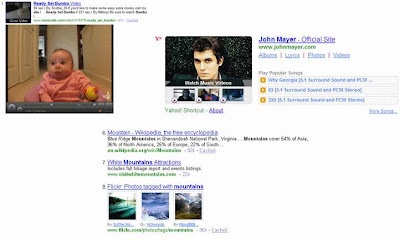 Search has also introduced multimedia integration including video, audio and photos (see below) directly into the search results, allowing consumers to get their answer -- whether it's a Web link, photo, video or music clip -- without leaving the page. [Manoj]: Do users interact with one type of blended search element (i.e: images or video or text or news) better than others, if so why? [Larry Cornett]: We have already seen good user interaction with our SearchMonkey enhanced listings. Our tests uncovered that users found this blending of structured data to be useful. In fact, in some cases, we saw a lift in click-through rate of as high as 15 percent. We believe that this enriched search experience helps users get directly to the answer they're seeking. [Manoj]: What did you think of Ask.com's search interface before they changed it back to more of a common search results pages. We thought the uniqueness might help attract more searches. [Larry Cornett]: I don't want to comment specifically on what our competitors are doing, but what I will say is that we are entering a period of massive change to enable search engines to handle more complex content on the Web as content continues to grow, change, diversify and fragment. At the same time, users are performing increasingly sophisticated and open-ended tasks online, connecting broadly to content and services across the Web. Given these changes, all search engines are becoming more sophisticated and the simple search result page of ten blue text links is evolving to help address these complex tasks. At Yahoo! our aim is to define the intent of the consumer when they are in search. From a SERP interface perspective we are doing this through Yahoo! 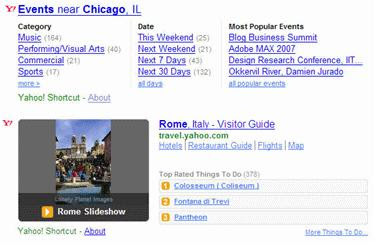 SearchMonkey, as I described earlier, which lets publishers creates more useful and visually appealing Yahoo! Search results which will drive more relevant traffic to their sites. For a user's perspective instead of just seeing a Wikipedia link and a snippet, you could call back to Wikipedia and show a photo, get more context about the article, maybe even present some of the external links or the edit history, whatever the publisher wants to do to enhance the result. A Yahoo! Local business listing could put structured information about itself as part of the result, like a photo of the store front and its main line number. Yahoo! SearchMonkey empowers publishers to customize the search experience to help user find what they want easily and the increased relevance of the result can drive traffic to publishers sites. In addition Yahoo! is differentiating our search experience by providing a safe search experience for our users with SearchScan. The SearchScan feature from Yahoo! Search provides a seamless way for users to search the web with confidence by reducing the risk of visiting dangerous sites on the Web with no download or fee required. It works by filtering out or alerts users to sites with possible spyware downloads, hacking risks, or sites that generate email spam. [Manoj]: According to comScore, Google has continued to get stronger in search market share in the last year. What do the other engines have to do in order to maintain and grow their own markets? [Larry Cornett]: Yahoo! is committed to providing an open, relevant search experience that understands the users' intent. That said, we have recently launched a service called Yahoo! Search BOSS - an open Web services platform that offers developers and companies the chance to create and launch Web-scale search products by utilizing the same infrastructure, technology and index that powers Yahoo! Search. BOSS fosters search innovation by enabling developers and companies to disrupt the search landscape by building their own world-class search experiences. Yahoo! is looking to fragment the search market, create an equal opportunity for all players, and expand the Y! Search advertising network through unprecedented access to our search infrastructure. By creating this new ecosystem for search, we may see changes in our market share, but largely at our competitors' expense. With BOSS, you can build your own search engine - one that recognizes the difference between blogs, user reviews, news and shopping sites, and clusters results accordingly. Developers and companies can use BOSS to create a more social search engine, in which rankings are determined by a users' social graph and combined with newsfeed results, or conduct a visual search to present thumbnails of the Web pages instead of links, making it more user-friendly for non-savvy searchers. Essentially, BOSS will enable a range of fundamentally different search experiences for companies big and small. [Manoj]: How is the search experience at Yahoo different than Google? [Larry Cornett]: Yahoo! has spent a lot of time and research creating a new search experience for our users. One of the things we know from our research is that our users struggle when they are searching on an unfamiliar topic. They often don't even know how to start their search. So in October 2007, we launched a significant new feature roll-out, which includes Yahoo! Search Assist and enhanced Yahoo! Shortcuts. Search Assist (see below) essentially helps users overcome one of their key pain points, which is how to craft an effective query. As they begin to type their query or their keyword into the box, it suggests other keywords that might be related to what they're typing. It also provides them the correct spelling of those keywords. And after they've conducted their initial search, Search Assist actually suggests related concepts based on their query to help them follow the right path to get the job done. We know from our research that another pain point for users is that search engines often don't provide the ultimate answer. They only help them down the path of finding the answer. And what we want to do at Yahoo! is actually start to begin to deliver what they really need within the search experience. So we're not just focused on the process of searching but really on the act of finding. And to that end, we have also introduced enhanced Yahoo! Shortcuts (see below) that actually deliver the most relevant information that our users are seeking for particular types of searches. So for example, if you type in the name of a movie at the very top of the search results page you get a link to a video trailer. You get local show times in your area, a link to a deeper description of that movie as well as reviews from critics and other Yahoo! users, right there at the top of the search results page. We're trying to deliver the most relevant information to our users immediately following their search to help make their job easier. We know that this is resonating with users, as Yahoo! was voted No. 1 in Search Assistance & Suggestions, according to a Dec. 2007 Keynote Systems study, "Keynote Customer Experience Rankings: Search". Some good info, thanks for the input - when is the release date for Search Monkey?